O'Gara and Wilson, Booksellers: I am going to Atlantis! For real! I am going to Atlantis! For real! I have trouble keeping still, gentle readers, especially when books are involved. The latest manifestation of this tendency is my upcoming trip to Santorini, in Greece, where I will be living and working at the bookstore Atlantis Books. It is aptly named, for the legend of Atlantis is thought to originate in Greece. The bookshop is rumored to be charming, and I hope it is, for I have never been there. But I can live in Santorini in exchange for volunteering there, and it sounds glorious, so I'm taking a chance. I, Lydia, shall return to beautiful Chicago in July! "When you leave your family in health, must you be hurried home to mourn a Dreadful Casualty! Philadelphians, your Rights are being violated!" 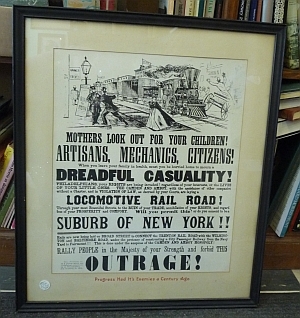 I love how the picture shows a mother holding an infant and running desperately, barely evading an onrushing train. 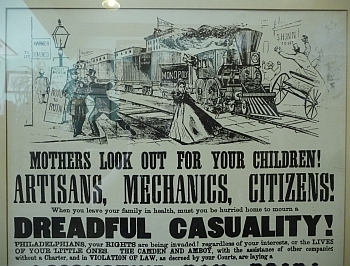 Was this picture total hyperbole, or were trains actually that unsafe -- lacking any fencing or warning signals whatsoever -- back in the bad old days? Either way, this poster is unimaginable today, and therefore hilarious. Also unimaginable today: life without any of the writers in this week's Affordable and Interesting item. 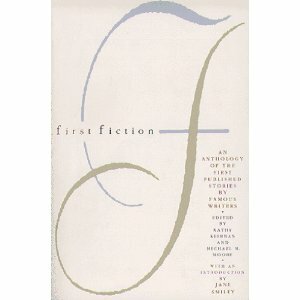 First Fiction: An Anthology of the First Published Stories by Famous Writers is quite a collection. It features first stories of luminaries ranging from William Faulkner to Ursula K. Le Guin. Not all of the stories are brilliant, but some are ... and even when the stories are un-brilliant, it's interesting to see how some authors began developing themes and styles that would be repeated in their later work. 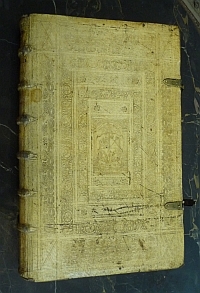 It's a good and varied read, for only $6.00! 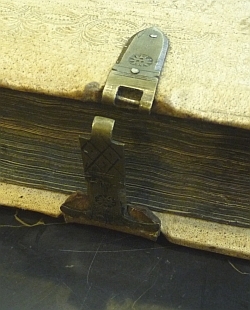 It's such a beautiful and well-maintained tome ... of course, it's been kept in a library, and that's what libraries are for. 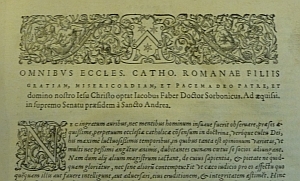 The book came to us from a gorgeous collection that we just purchased from the Meadville-Lombard seminary, which used to be located here in Hyde Park but has since moved to the Loop. 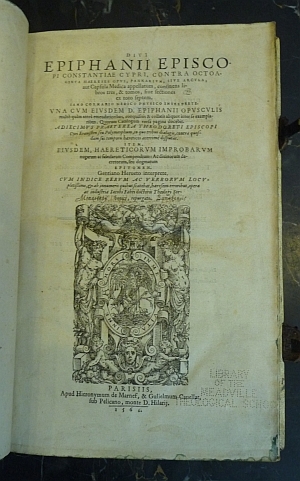 We are charging $950.00 for it, and we have plenty of other antique theological books where that came from! Well now. I guess that's all from me ... for now, gentle readers. For now. I'll try to post a nice blog entry from Atlantis!